First let me start off by saying that yes, my neighbor is photobombing. What is it with my neighbors?!?!? She even matches! So anyways, I love this outfit because I just mixed colors. There really is no mustard in the top but for some reason it looks amazing with mustard on the bottom. When picking outfits, don't ever be afraid to mix colors even if you're just introducing a new color into your look. 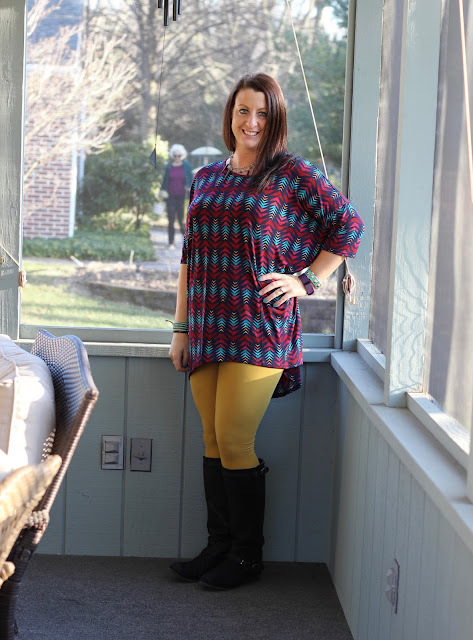 This is a large LuLaRoe Irma with OS mustard leggings.